Identify what you like about your favorite items. The style, color, and construction material, such as wood, metal or fabric covered, offers a basis to build upon and should be carried through in other areas of the room. For example, metal finishes can be repeated in lamps, railings or even the cocktail table, while colors should be carried through in throw pillows and window treatments. If your favorite piece has an unusual design, and you feel it doesn’t define your personal style, you may use it as an accent piece. It can and will add character to the room. Creating a great room design is more than selecting a style of furniture. Focus on choosing a variety of elements that will complement each other. This is the key to developing an elegant interior that your family, friends and relatives will admire. Last but not least, the arrangement of furniture within the confines of the room contribute to your personal interior design style. Floor plans integrate architectural features and develop traffic patterns within the room. Ultimately, you want your floor plan to suit the function of the room – allow for open areas, special activity areas, and flexibility to move things around to suit the needs of your family. Using these design concepts will allow you to identify the building blocks of your personal interior design style and how to apply them in your home. 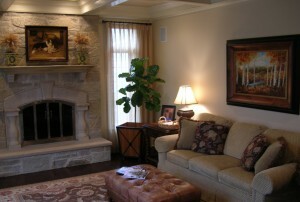 Go to my website http://www.SibravaInteriors.com for ideas and inspiration. Nancy Sibrava is a Licensed Interior Designer, ASID Associate Member, IDS Professional Member and a Certified Residential Designer.